Our vision is of a world in which all people have the knowledge they need to achieve their full potential. However, as technology continues to provide new opportunities to access and share information, billions of people around the world are still unable to reap the benefits. To address this critical issue, EIFL partners with libraries and library consortia, as we believe that this is the most sustainable way to improve access to knowledge. Today we reach more than 14 million people through our network of libraries in over 60 developing and transition countries, and the outcomes of our work in 2013 demonstrate that we are making progress in pursuit of our overall vision. I am pleased to share with you some highlights. Over the last five years we have supported the World Blind Union and Knowledge Ecology International in advocating for international copyright law reform to end the “book famine”, the fact that blind and visually impaired people — 90% of whom live in the developing world — have access to less than 5% of published in-copyright works. In June, Member States of the World Intellectual Property Organization (WIPO) adopted the Marrakesh Treaty to facilitate access to published works by blind, visually impaired and otherwise print disabled people. To address the financial barriers that libraries face in providing access to knowledge, we continued to negotiate affordable pricing for commercial e-resources. In 2013, we achieved estimated savings of over US$ 183 million for libraries in our partner countries. Subscriptions to negotiated-free e-resources increased by over 30%, the average discount rose to 98%, and more than 3.7 million full text articles were downloaded from EIFL-licensed e-resources. We also remained at the forefront of the open access (OA) movement, advocating for the free online availability of research literature through our network. Over 140 OA repositories were launched in our partner countries and 14 institutions introduced OA policies. This means that a wealth of new knowledge and research from developing and transition countries has been made available to the world. Seven EIFL-partner library consortia — in Armenia, Azerbaijan, Ethiopia, Lesotho, Macedonia, Malawi and Slovenia — celebrated their tenth anniversaries in 2013. All have demonstrated strong membership growth, enabling more institutions, and thereby more people, to benefit from their services. We also welcomed Fiji as a new partner country, and we look forward to working with the library community to build a consortium. In 2013, we were recognized for our work on the global stage. The Accelerating Science Award Programme recognized EIFL as one of seven high impact OA advocacy organizations and Iryna Kuchma, Open Access Programme Manager, received the Electronic Publishing Trust for Development’s Annual Award for Individual Effort in Support of Open Access. I was honoured to accept a prestigious World Summit on the Information Society Project Prize, in the capacity building category, on behalf of EIFL and our public library grantees in 23 countries in Africa, Asia, Europe and Latin America. The award was in recognition of the work of our Public Library Innovation Programme (PLIP), which enables public libraries to develop innovative technology-based services that improve lives and livelihoods. Through the programme, over 12,000 have benefited from training at public libraries — from subsistence farmers to vulnerable youth and from unemployed women to the homeless. We would like to thank our partners and funders who continue to support our work. We would also like to thank our talented team of staff, board members and EIFL coordinators for their enthusiasm and commitment. We look forward to the opportunities and challenges ahead. Numbers aggregated from the 2013 consortium survey completed by 36 EIFL-partner countries. Universities, colleges and research institutions. Numbers aggregated from the 2013 consortium survey completed by 36 EIFL-partner countries. Ten years ago Malawi Library and Information Consortium (MALICO) members examine electronic information resources at Bunda Library. EIFL-partner library consortia in seven countries — Armenia, Azerbaijan, Ethiopia, Lesotho, Macedonia, Malawi and Slovenia — celebrated their 10th anniversaries in 2013. Many of the consortia received start-up grants from EIFL, and all have benefited from our consortium management training, consultancy and support services. Looking back, consortia leaders spoke about the value of the partnership with EIFL. Tseli Moshoeshoe-Chadzingwa, chairperson of the Lesotho Library Consortium (LELICO) and a member of the EIFL Advisory Board, recalls how the partnership with EIFL modernized libraries: “At the start, there was a limited understanding of what library consortia are supposed to do,” said Tseli. Through effective advocacy and outreach efforts, all seven consortia have achieved tremendous growth in the number of member libraries. Each consortium now offers access to between 20 and 80 commercial e-resources (many through EIFL-negotiated agreements), including e-journals, e-books and reference information. As a result, access to knowledge has increased dramatically, and students and researchers now benefit from the latest information from around the world. At the start, there was a limited understanding of what library consortia are supposed to do. No one could ever have predicted that a library in Lesotho would be providing electronic information to clients. In fact, the issue of electronic information was almost unheard of. Tseli Moshoeshoe-Chadzingwa, chairperson of the Lesotho Library Consortium (LELICO) and a member of the EIFL Advisory Board. Kevin Smith from Duke University Libraries answers questions. The 2013 EIFL General Assembly (GA), our annual knowledge sharing and networking event, took place in Istanbul, a city that lies on the ancient Silk Road, which has facilitated the intercultural exchange of goods and knowledge over many centuries. 82 participants from 47 countries met to debate the latest developments in electronic content delivery, to discover emerging issues of significance to libraries, and to share achievements from library consortia over the last year. The new “Trends to Watch” sessions proved to be a great success. Led by expert guest speakers, they sparked a great deal of interest and discussion on leading-edge topics such as redefining research assessment, massive open online courses (MOOCs), open research data, and text and data mining. A new poster session showcased 20 projects supported by EIFL in the areas of open access and copyright and libraries. Other sessions included recent developments in the landscape for e-monographs, an informal knowledge sharing session on library consortia achievements, an overview of resource discovery technologies, and updates in EIFL programme areas. Participants also had plenty of opportunity to share knowledge and experiences informally through group meals and social events. 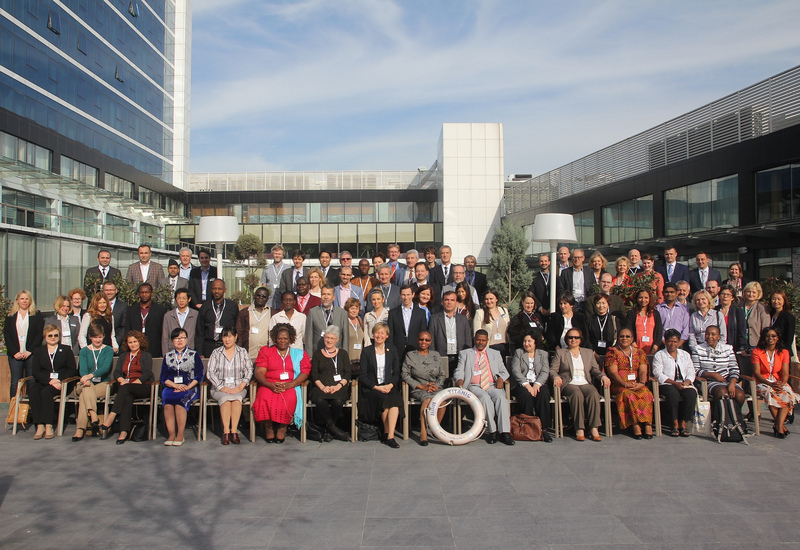 Participants who attended the 2013 EIFL General Assembly in Istanbul, Turkey. The presentations were informative and the spirit of friendship that prevailed throughout the GA reinforced the understanding of issues discussed. I intend to share my new knowledge with our library consortium members back home in Nigeria. This is my first time at the EIFL General Assembly. It is wonderful to be among a diverse group of such committed people, a truly uplifting experience. There were some challenging questions that opened my eyes to different perspectives, so it has been tremendously beneficial for me. I found the GA especially interesting this year. The ‘Trends to Watch’ sessions were very exciting. I kept thinking to myself: how can I implement these ideas when I get home? Sustainable access to high quality information is essential for education, research and socio-economic development. But the high cost of many commercial e-resources is a major barrier to knowledge in developing and transition countries. We also work closely with library consortia to promote awareness of available e-resources, and to encourage subscriptions and usage. EIFL has negotiated free or highly discounted access to over 40 commercial e-resources from more than 20 publishers and aggregators. 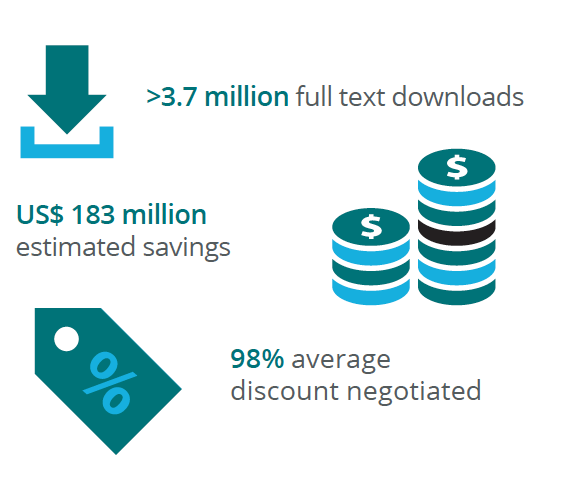 In 2013, we achieved estimated savings of over US$ 183 million for libraries in our network, and the average discount increased to 98%. The number of subscriptions to negotiated free e-resources increased by over 30%, and there were more than 3.7 million full text downloads. 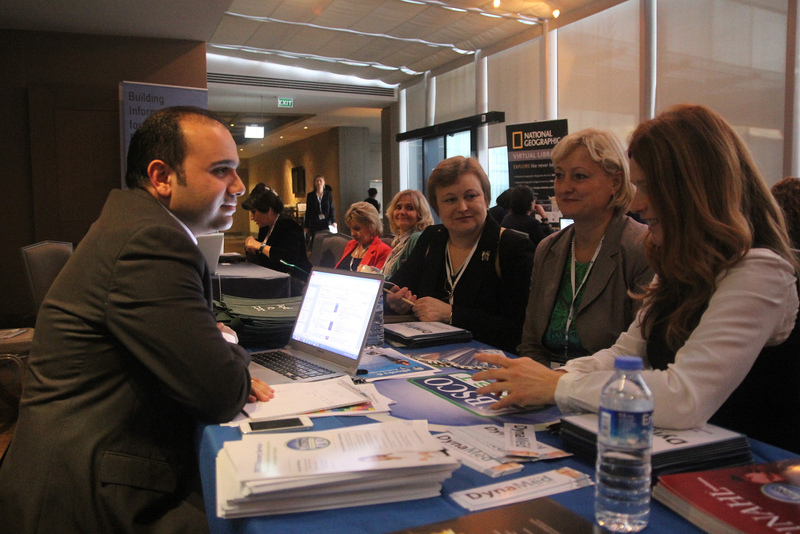 Publisher Mehmet Can Soyulmaz from EBSCO Publishing meets with EIFL Coordinators from Lithuania and Slovenia at the 2013 GA. In the packed hallway of a hotel in Istanbul at the EIFL General Assembly (GA), senior representatives from 47 EIFL-partner library consortia talk animatedly about access to e-resources in their country with representatives from 15 EIFL-partner publishers. When fifteen minutes are up, and at the sound of a whistle, it’s time for the consortia representatives (EIFL Coordinators) to move to the next table and to begin a new conversation with a different publisher. Enabling effective knowledge sharing between publishers and librarians is vital to expanding access to e-resources in developing and transition countries. Why? In order to expand availability of e-resources, pricing needs to be realistic and sustainable — and this depends on the country. One “size” does not fit all. EIFL partners with library consortia in over 45 countries at different stages of development, and it’s hard for EIFL-partner publishers to be expert on the local situation in all of them. For example, what are the key barriers to the use of e-resources in Armenia? What is the technological infrastructure like in Laos? How do library budgets in Lithuania compare to those in Zimbabwe? Providing an opportunity for EIFL-partner publishers and EIFL Coordinators to sit down together and talk is therefore invaluable. To address this need, in 2013, the EIFL- Licensing programme organized another fun yet intensive programme of “speed-dating” sessions during the GA.
During these sessions, EIFL Coordinators had the chance to talk to publishers about their libraries’ needs and the issues they face. Coordinators also got to hear from publishers about new products and services that will benefit teaching and learning in their countries. “In Fiji, our libraries face multiple challenges in the effort to build information collections and provide access to students,” says Chaminda. 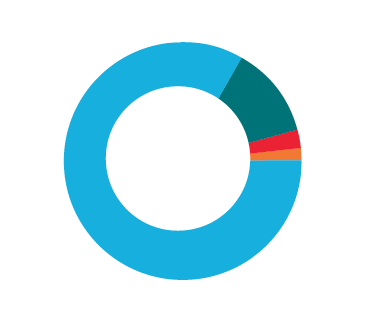 The GA is also very popular with publishers. Fifteen companies attended in 2013 and provided valuable sponsorship. “The EIFL GA offered a perfect networking opportunity for librarians and publishers,” says Ewa Klorek, Journal Area Sales Manager, Taylor & Francis Group. Due to the financial crisis, last year our libraries couldn’t subscribe to new databases and we had to cancel subscriptions. Thanks to the EIFL-Licensing programme, our libraries got access to nine databases free of charge or at highly discounted rates. This has really helped us a lot and has helped our researchers to do important research referring to these databases. Diana Jeries Sayej-Naser, Palestinian Library and Information Consortium (PALICO) and EIFL Country Coordinator. The number of full text downloads in 2013. The estimated savings for EIFL partner library consortia in US dollars. The average discount negotiated for EIFL partner library consortia. Restrictive copyright laws create legal barriers to the access and use of resources for education, research and personal development. 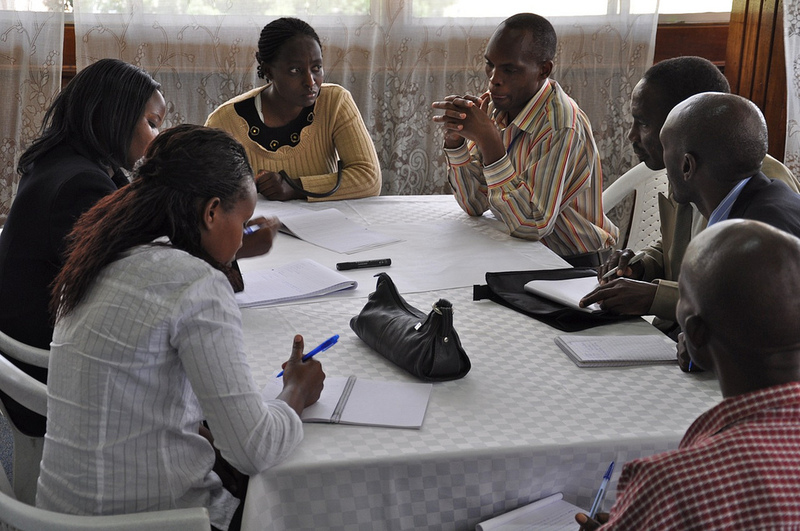 We build the capacity of librarians in our partner consortia on copyright issues and advocacy. We produce unique resources on topical issues, which are translated into many languages. We also play a leadership role in promoting national and international copyright law reform. In 2013, EIFL supported eight national campaigns for improved copyright laws for libraries in Armenia, Estonia, Latvia, Mongolia, Poland, Senegal, Uganda and Uzbekistan. All campaigns demonstrated impressive achievements and laid the groundwork to change laws that are out of step with the digital environment. Librarians made new connections with policy makers, and are now in a much stronger position to advocate for copyright laws that support wider access to knowledge. Over 1,100 librarians were trained in library copyright issues. 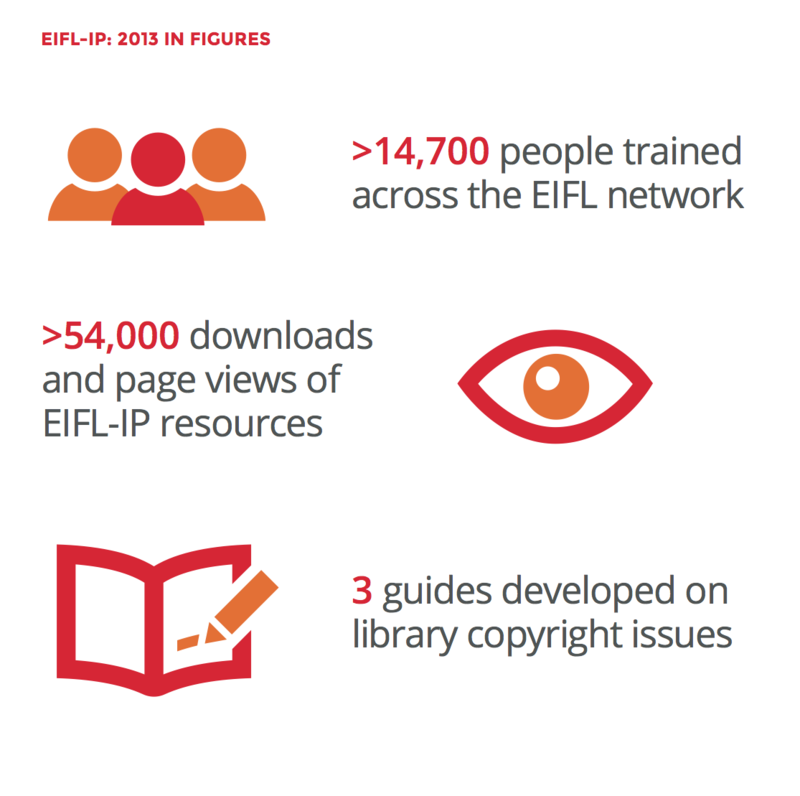 In addition to these campaigns, more than 13,600 librarians benefited from training and information sessions organized by EIFL-partner consortia on copyright-related topics. Our highly regarded online open curriculum, Copyright for Librarians, is now also available in Serbian and Spanish, in addition to Arabic, Chinese, French, Polish, Romanian/Moldovan and Russian. We also produced three new guides on library copyright issues. 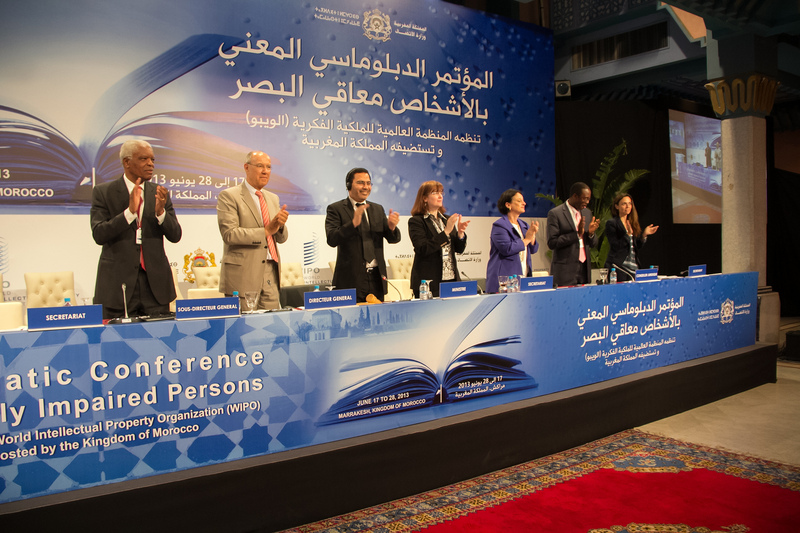 WIPO delegates adopt Marrakesh Treaty for the visually impaired. © WIPO 2013. Credit: Avant Scène / Hicham Rachidi. Blind and visually impaired people, 90% of whom live in the developing world, have access to less than 5% of published in-copyright works. To help solve this issue, EIFL supported the World Blind Union (WBU) and Knowledge Ecology International (KEI) through five years of negotiations with Member States of the World Intellectual Property Organization (WIPO). The aim was an international treaty to facilitate access to published works by people who are blind, visually impaired and otherwise reading disabled. EIFL was, therefore, proud to participate in the Diplomatic Conference to conclude the new treaty in Marrakesh, Morocco in June 2013. The adoption of the Marrakesh Treaty sets in place an international legal framework to enable the creation of accessible format copies (such as electronic text, audio, Braille), and the sharing of accessible materials across national borders. Teresa Hackett, EIFL-IP Programme Manager, delivered a statement on behalf of EIFL and described how EIFL-partner libraries are struggling to provide content for their print disabled users because of legal barriers. She told how blind children at Ulaanbaatar Public Library in Mongolia cannot get modern textbooks for their DAISY readers, how the Lithuanian Library for the Blind is unable to provide literature in Polish and Russian for national minorities, and spoke about the chronic shortage of accessible books at Lesotho’s National University Library. “This is not the end of a process, but the start of an era — an era of hope that the blight of the book famine may finally be coming to an end,” concluded Teresa in EIFL’s closing statement. Looking forward, EIFL will continue to advocate for libraries in partner countries to ensure that the treaty is implemented into national law, and that its benefits are passed on quickly to blind, visually impaired and print disabled library users. We learned that to achieve a modern copyright system that supports libraries in maximizing access to knowledge, librarians must be smarter in explaining the ideas that underlie copyright, and more active in training each other on how to negotiate fair licence agreements. Marat Rakhmatullaev, Tashkent University of Information Technologies and EIFL Country Coordinator in Uzbekistan. People trained across the EIFL network. Guides developed on library copyright issues. Open access (OA) is the immediate, online, free and unrestricted availability of peer reviewed research literature. The EIFL Open Access programme (EIFL-OA) advocates nationally and internationally for the adoption of OA policies and mandates. We help to launch OA repositories and OA journals, and to share research data and open educational resources. In 2013, over 5,450 people in 13 countries improved their knowledge about open access through our advocacy campaign grants. Through webinars, we reached more than 100 people in over 20 countries. In addition, more than 49,670 people attended other training events organized by EIFL-partner consortia. “A lot of research has been undertaken over the years in Uganda, and breakthroughs made. However, results have not been disseminated and, as a result, have not added value to the lives of Ugandans,” said Dr. J. C. Muyingo, Minister of State-Higher Education in Uganda. Dr. Muyingo was speaking at the very first national open access conference, which EIFL co-hosted with the Consortium of Uganda University Libraries (CUUL) in May 2013. He called upon the National Council for Higher Education and Makerere University to put in place a system to ensure that all publicly-funded research becomes freely and openly available. Barriers to accessing research and sharing knowledge are not only an issue in Uganda. Every year, libraries around the world advocate for change by taking part in Open Access (OA) Week, a global event that calls for open access as the new norm in scholarship and research. In 2013, over 30 EIFL-partner countries hosted advocacy and awareness-raising events during OA Week. 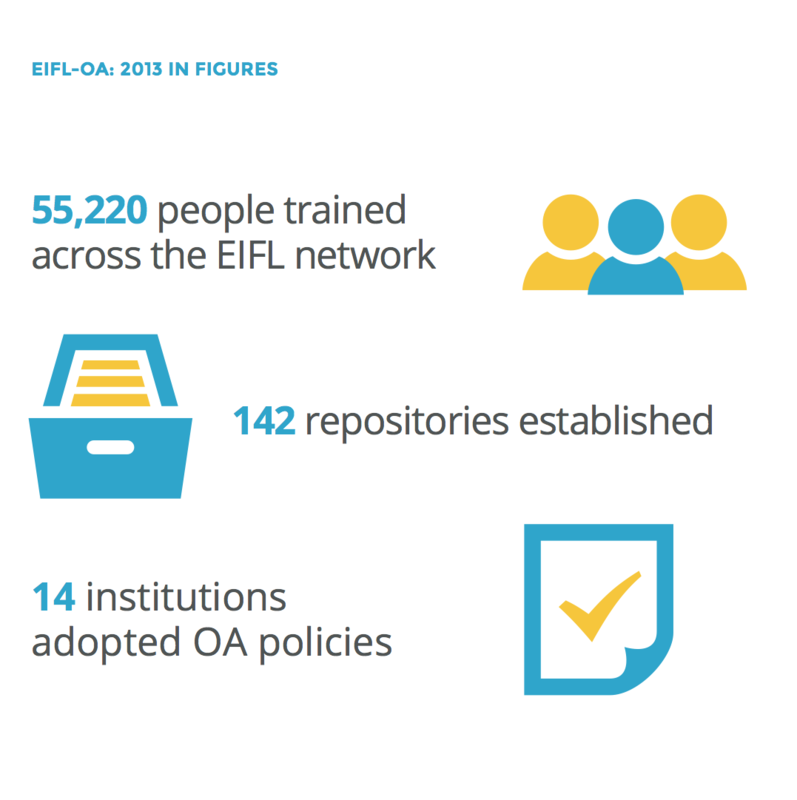 EIFL’s Open Access programme encouraged libraries across the network to participate and provided assistance in their preparations. In celebration of Open Access Week 2013, we reached out to librarians and partners within our global EIFL network to ask one simple question. Gintarė Tautkevičienė, Kaunas University of Technology and EIFL-OA Coordinator in Lithuania. Open access gives us the possibility to access worldwide scientific information and be better informed about research results in the field. As a researcher, I receive background and ideas for continuation of my research. As a librarian, I can provide more information resources to our university community. Jagadish Aryal, Social Science Baha Library, EIFL Country and OA Coordinator in Nepal. Open access means no restriction in getting and sharing knowledge. Any scholarly creations, research output and literary works such as articles, books should be easily available to its seekers. Resources should be available online and free of charge. Biljana Kosanović, National Library of Serbia and EIFL Country Coordinator. Open access means to read and to learn without barriers. To witness how technology is changing and causing other standardized procedures to change. A way to survive constantly decreasing library budgets. EIFL’s support has been invaluable in drafting an OA policy at the University of Nairobi. This policy helped us to populate our OA digital repository with 62,034 documents and it has opened up a wealth of knowledge from our researchers to the world. Rosemary Otando, University of Nairobi Library, EIFL Country and OA Coordinator in Kenya. The number of open access repositories established in 2013. When communities have access to information, there is greater potential for socio-economic development. Public libraries in developing and transition countries are uniquely placed to offer vital information services. Yet, in most cases, they lack the resources and technology to offer these services. Through the EIFL Public Library Innovation Programme (EIFL-PLIP), we enable public libraries to develop new services that use digital technology. We do this by giving small grants and by building librarians’ capacity to innovate. In addition to providing direct support to encourage the creation of new services, we present Innovation Awards to recognize and reward successful public library services that use technology to contribute to community development. In 2013 we concluded 11 EIFL-PLIP projects in Ghana, Kenya, Tanzania and Uganda. Results from our evaluations show that innovative public library services have helped farmers to eradicate plant pests and diseases, and to increase their yields; mothers to give birth safely; health workers to send information to their patients; and school children to improve in important subjects such as mathematics and science. With EIFL-PLIP support, 117 library leaders and public librarians in Ghana, Kenya and Uganda received advocacy and communication skills training. They are now putting these vital skills to good use in raising awareness about how public libraries can advance community development, and in advocating for government support to improve library services. Schoolchildren use tablet computers pre-loaded with educational content at Kibera Public Library in Kenya. From the moment it opened its doors to the community, Kibera Public Library has made helping children a priority. Kibera is eastern Africa’s biggest slum, where thousands of families live in cramped and unhealthy conditions. Children in the slum face many challenges. Most schools do not have electricity. School dropout rates are high. On the streets, children are vulnerable. But in the library, they feel secure. In 2012/13, and with support from the EIFL Public Library Innovation Programme, Kibera Public Library’s ICT for Education Project has focused on improving children’s school results. 48 teachers and 120 primary and secondary school children have been trained to use tablet computers pre-loaded with educational content, which is linked to the school curriculum. 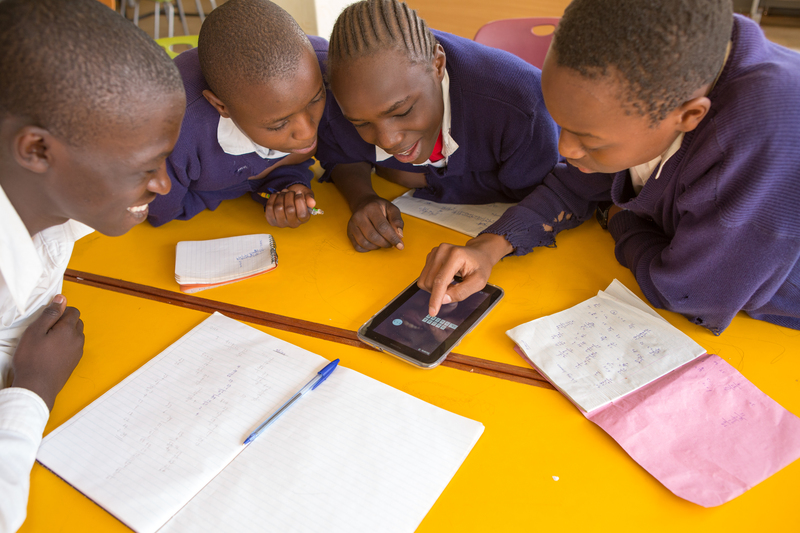 The tablets connect to the internet and the content, designed by the Kenyan educational agency, eLimu, uses quizzes, songs, puzzles, animations and video to make learning collaborative and fun. Enthusiasm for the project continues to remain high in Kibera and, after just one year, teachers reported that students’ exam results have improved. Kibera Public Library’s ICT for Education Project for children has successfully demonstrated the effectiveness of internet-connected tablet computers in supporting classroom teaching. The successful performance of the EIFL-PLIP supported project at Kibera Public Library has inspired us to seek additional funding to replicate it in other branches of the Kenya National Library Service. Many more children now come to the library wanting to use the tablets to access digital educational materials and games. This project has really captivated the interest of children to use their free time constructively in the library. Being able to use the tablets at the library was a real privilege. We learnt how to Google, to do research, practise math online and solve puzzles. 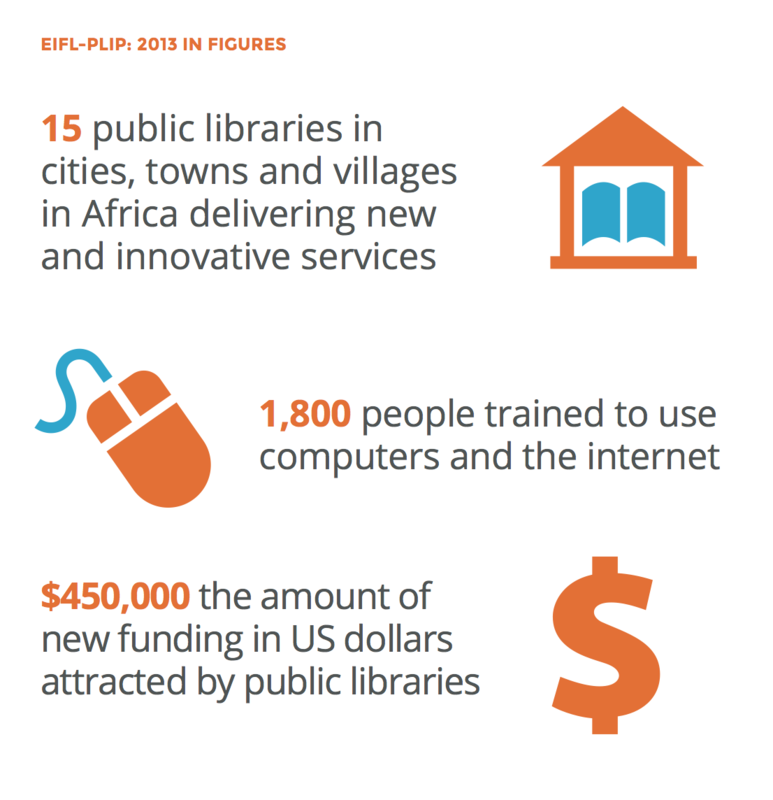 Number of public libraries in cities, towns and villages in Africa delivering new and innovative services. People trained to use computers and the internet. The amount of new funding in US dollars attracted by public libraries. Licence fees for commercial software applications are a significant barrier to the development of modern ICT infrastructure in libraries in many countries. There are now free and open source software (FOSS) tools to support almost all library functions. However, libraries are often not aware of what is available, and staff may lack the skills required for successful installation and maintenance. Through the EIFL-FOSS programme, we build awareness and understanding about developments of FOSS applications. In 2013, we encouraged further deployments of FOSS in libraries by publishing four case studies that demonstrated how libraries can improve services to their users by using FOSS applications. We ran seven webinars, which were attended by over 150 people from 39 countries. Recordings of the sessions have been viewed over 300 times. Key software developers facilitated several webinars that included Q&A sessions, which gave participants the opportunity to ask questions which ranged from installation to further plans for development. In addition, more than 700 librarians and information technology (IT) staff benefited from training and information sessions on free and open source software applications for libraries that were organized by EIFL-partner consortia. If it weren’t for the Free and Open Source Software Programme, our libraries (with small and poorly funded budgets) would still be behind in library technologies and performance. 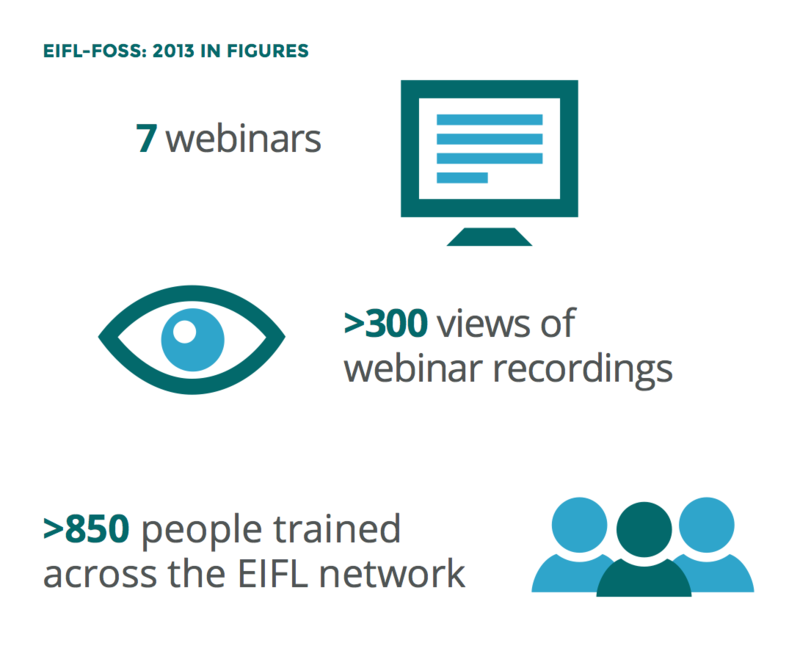 The number of EIFL-FOSS webinars conducted in 2013. Views of EIFL-FOSS webinar recordings in 2013. 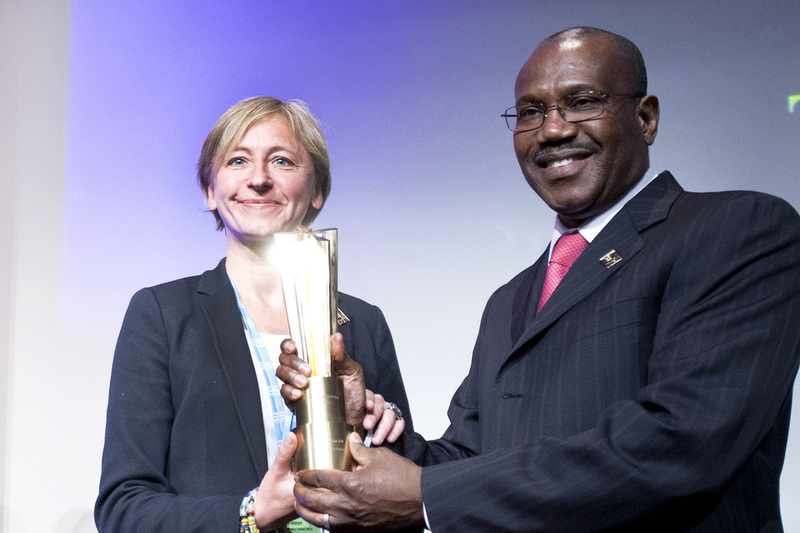 Rima Kupryte (left), Director of EIFL, is presented with the WSIS Project Prize by Dr Hamadoun Touré (right), Secretary-General of the International Telecommunication Union (ITU) at the opening ceremony of the WSIS Forum 2013 on May 13, 2013. EIFL was awarded a prestigious WSIS Project Prize from the World Summit on the Information Society (WSIS) for “excellence in implementation of its outcomes to achieve an inclusive and development-oriented information society. The award, in the capacity building category, was in recognition of the work of our Public Library Innovation Programme (PLIP), which enables public libraries to develop innovative technology-based services that improve lives and livelihoods. The Accelerating Science Award Program (ASAP) panel of industry experts recognized EIFL as one of seven high impact open access advocacy organizations. 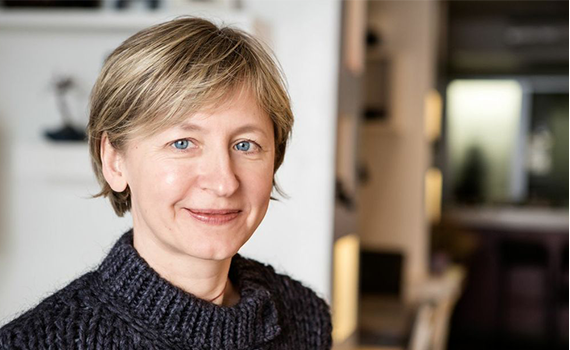 Iryna Kuchma, EIFL Open Access Programme Manager, received the Electronic Publishing Trust for Development’s Annual Award for Individual Effort in Support of Open Access. 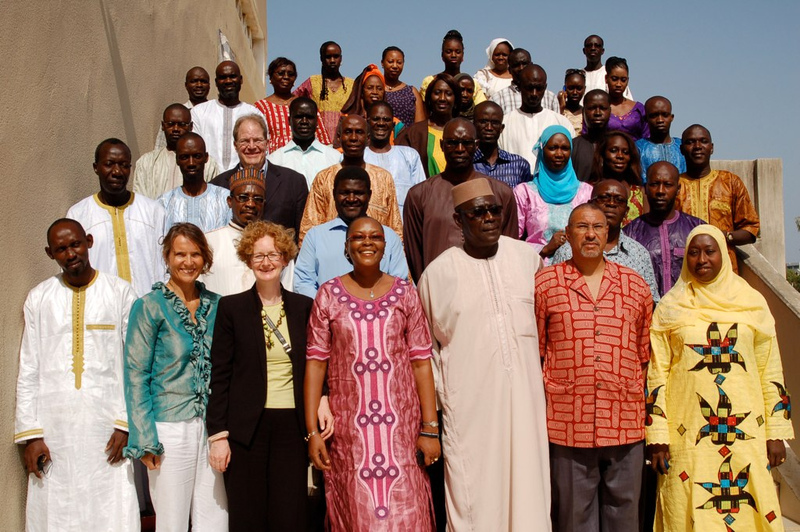 Participants from EIFL’s Copyright for Librarians regional seminar in Dakar, Senegal. In 2013, EIFL organized, supported or participated in 78 events, workshops and conferences around issues that affect access to knowledge. View the list of 2013 events. EIFL staff enjoy the fresh air after a planning meeting (clockwise from left) Jean Fairbairn, Simona Siad, Andrius Kriščiūnas, Teresa Hackett, Susanna Lob, Rima Kuprytė, Ramunė Petuchovaitė and Iryna Kuchma. Participants at the 2013 EIFL General Assembly gather in Istanbul, Turkey. 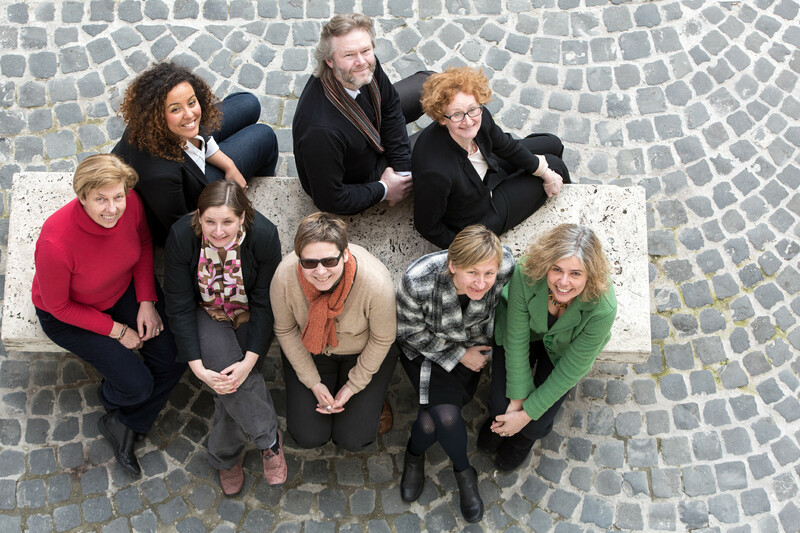 We would like to thank all of our EIFL Country Coordinators, Licensing Coordinators, OA Coordinators, FOSS Coordinators and Copyright Librarians for their enthusiasm and hard work in 2013. View our full gallery of coordinators here. 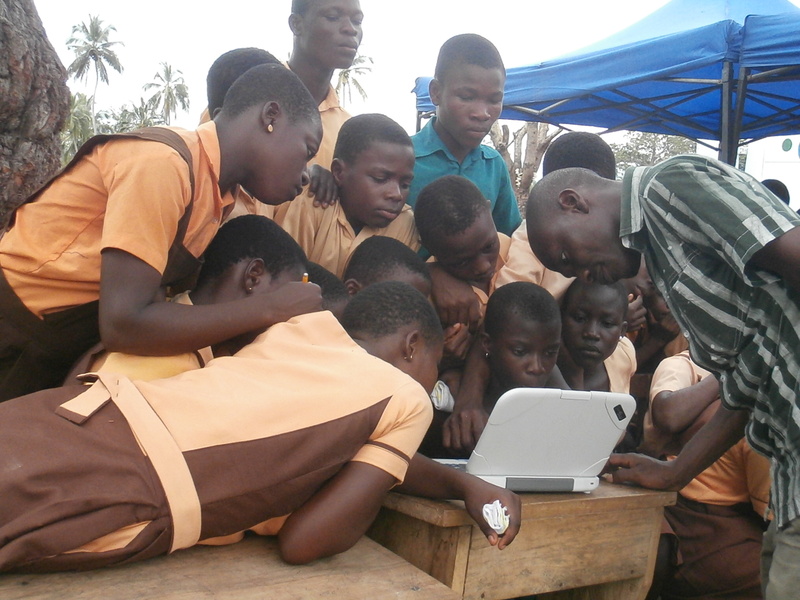 Children learn how to use solar-charged laptops at Volta Regional Library in Ghana. 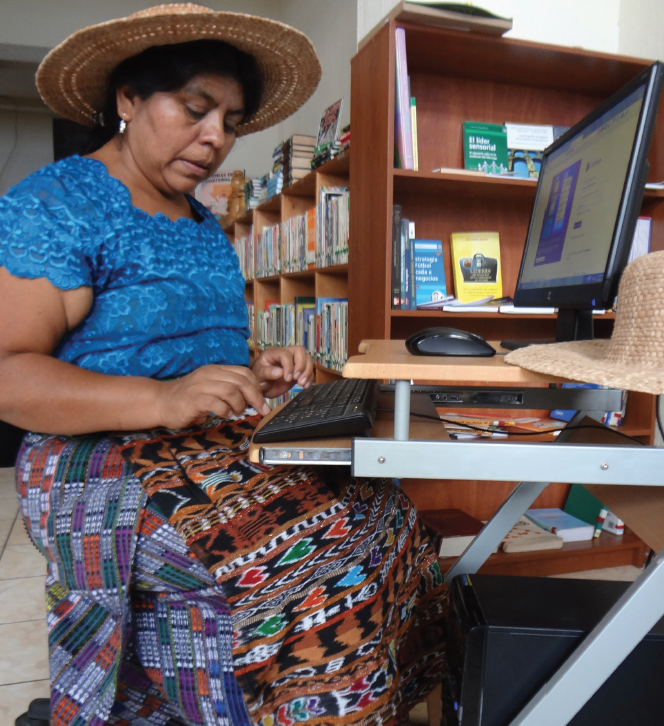 Rosalinda Tay, a skilled weaver, uses the computer at the Rija’tzuul Na’ooj Library in Guatemala. EIFL has built relationships with a wide range of organizations to make knowledge more accessible. In 2013, we worked with the following partners.